You Had a Baby? This is How You Get Your Body Back! If you haven’t seen an ad on how to “get your body back!” after giving birth or seen a “news” story on how some celebrity new mom “got her body back,” you have not LIVED! Seriously, it means you are probably not alive. You should get that checked out. Because the rest of us are being beaten over the head with the lie that women with post-baby bods have no bodies at all. Until we “get our bodies back” through fitting into the narrow and nearly unattainable ideals, we’ve got nothing. Except shame, depression, and anxiety. We can have all of that we want! Instead of encouraging us to recognize how AMAZING it is that our bodies helped to create and house and give birth to friggin BABIES, media makers and many industries want us to forget that little bundle of joy and focus on our appearances. Of course pregnancy has a significant effect on the way our bodies look, but isn’t that the least interesting aspect of the whole pregnancy/giving birth experience? This NEW focus on what bodies look like after pregnancy is a reflection of the way we have been trained to view ourselves and all women — just bodies. Just something to look at, pick apart, judge, and obsess over. But we are more than that, and if you don’t know that, please let us drill it into your brain. It’s what we do best! 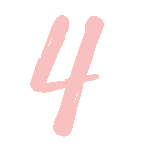 Moms and moms-to-be, we’ve got 4 awesome, simple ways you can reclaim your body — “get it back” — and reject the lie that you are a body alone and your highest priority is looking good for all those onlookers. Kourtney Kardashian, a new mom Photoshopped out of reality. Take this cover of OK! magazine. Or any cover of any woman’s mag, any day of the year. Here we find a heavily Photoshopped image of Kourtney Kardashian, just one week after she had her first baby. 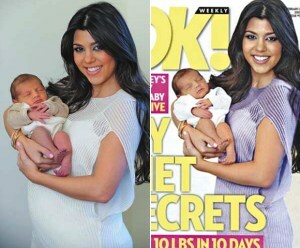 The headlines tell us to look inside to see how Kourtney lost all her baby weight immediately! And do you know what the advertisements inside tell us? Kourtney was a spokesperson for Quiktrim, a diet pill not approved by the FDA. This magazine is also sponsored by a range of other advertisers begging you to believe Kourtney lost all her baby weight in just days and they can help you pull off that feat, too. Never believe the lies sold to you in a magazine. All you have to do is look at who is advertising to know what the women within the pages MUST look like in order to sell the products being advertised. That is how media makers rake in their money – advertising. 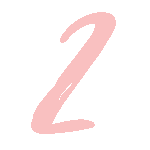 Have you ever had a friend online invite you to an body wrap party? If you’re a new mom, I bet you have. 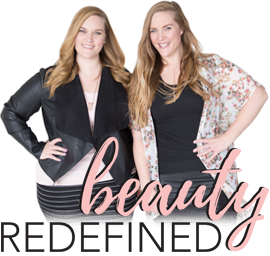 Ads like the one to the left sell you on body shame and hope. 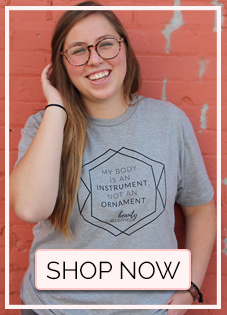 These types of advertisements perpetuate the lie that women are bodies to be judged, looked at, and fixed and we cannot be happy with our bodies after pregnancy. For new moms or moms-to-be, ads like this need to be your arch nemesis. Ever heard of the “mommy makeover” sold by cosmetic surgeons? In Utah, where we just graduated with our PhDs, it’s inescapable. Utah’s chart-topping birth rate and early marriage age lead to the perfect storm for the ultra-popular “mommy makeover,” which includes breast enhancement, tummy tuck, and lipo. You can get that makeover immediately after having a baby! 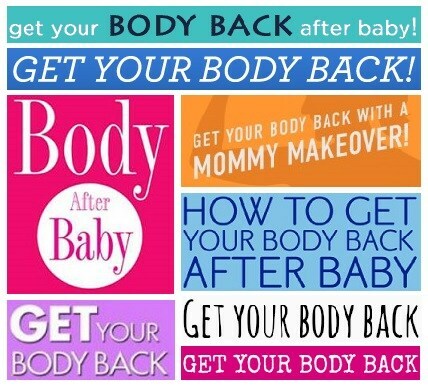 Who needs to get to know their baby when she can “get her body back” instead? Cosmetic surgeons capitalize on this body-shaming trend far too often, and it doesn’t just happen in Utah. It’s everywhere. Kari, a mother of two, runner, and awesome example of reality! Your body is a site of resilience and resistance. Reclaim it. Our doctoral research reveals that motherhood is actually a resilient trait that boosts positive body image and motivates women to be positive role models of healthy body image for their kids. This resilient concept revealed itself again and again in our research as a resilient force women called upon to remind them of their responsibilities, worth, and opportunity to be a force for good to a growing generation that desperately needs it. Instead of complaining about weight gain and stretch marks — marketed to women as reasons mothers need to “get their bodies back” — several of our study participants wrote about the empowerment of growing a child and how awesome it is that their bodies created miracles. While media and many of our cultural messages try to shame mothers for the physical effects of growing babies within their bodies, motherhood can offer a unique and powerful opportunity for resilience in the face of body shame. Plus, moms can actually use their post-baby bodies as communicative tools that they can use to resist the lies they are being sold in media about what it takes to be valuable and beautiful. The mothering body can be a resistive site by reclaiming it as a site of women’s own life, pain, and joy. Your body can house and feed a baby. Your body bears the signs of that miracle. Your body is REAL. You can use your body to resist the Photoshopped lies about what moms should be and look like. We were so happy to see Kate Middleton do that as she refused to hide her body after having her baby. 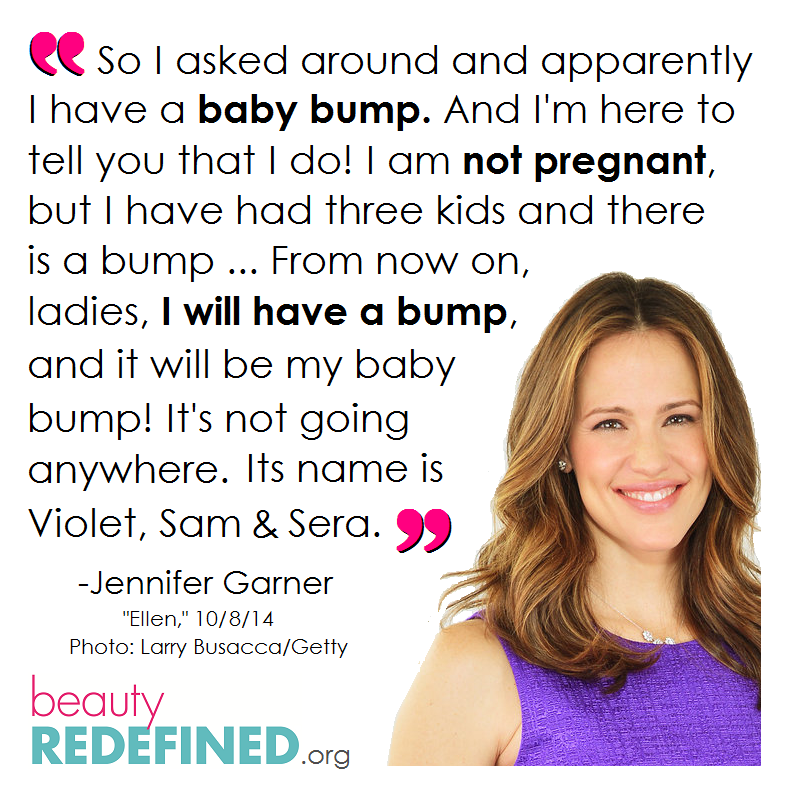 She came out into the world and joyfully shared her baby and her post-baby body with the world. 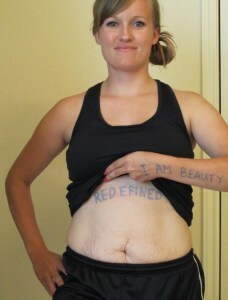 Our friend Kari, mom of two, a runner, and a great woman, snapped this “I am Beauty Redefined” picture to show the world what one healthy, happy mother’s body looks like. You can be an example of what motherhood is all about by shutting down the body comments and putting the spotlight on the awesomeness of your baby and your new life. When Kristen Bell spoke up about her awesome stance on not talking about her weight, it sounded like a radical notion. That kind of talk is unheard of in a media world where women like Kim Kardashian are bullied for their pregnancy weight gain and then do interviews claiming their “No. 1 priority is weight loss” after they give birth. Youch. Do you know why her statement went viral? Because women everywhere are starving for that uplifting, awesome example of what motherhood can be. They are begging for that light at the end of the body-shaming tunnel. They need to know they are valuable no matter what their breasts or stomachs or hips look like — after giving birth or otherwise. You can be that light. 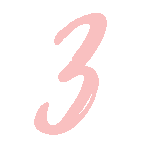 The next time someone comments on your post-baby weight, whether positively or negatively, shut it down by talking about how you have chosen NOT to focus on your weight and instead focus on your baby, your happiness, your new responsibilities, ANYTHING. Teach those in your circle of influence that you are so much more than a body. Start as a new mom so you don’t pass along the pain of negative body image to your babies. It is one of the worst things you can do to them. For more inspiration on the mother/daughter relationship, read this. Go on a media fast. It’ll change your life. Rather than cutting out food, cut out media. Cleanse your mind in order to cleanse your body. Choose a time period — 3 days, a week, a month, or more — and avoid media as much as humanly possible. All of it. No Twitter/ Instagram/ Facebook, TV, Netflix, movies, blogs (aside from this one, obviously), radio, and any advertising you can avoid. Without this never-ending stream of biased, $-driven, idealized, Photoshopped, self-promoting messages and images, you give your mind the opportunity to become more sensitive to the messages that don’t look like or feel like the truths you experience in real life, face to face, with real people and your own health choices. Without those messages, you can see how your life is different and how your feelings toward your own body are affected. When you return to viewing and reading popular media, you will be more sensitive to the messages that hurt you and those that are unrealistic for you. Then you can make personalized, critical, well-informed media choices for yourself and your household that will uplift and inspire, and promote health rather than objectification and unattainable appearance ideals. 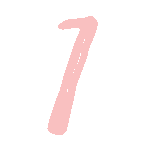 Read more about the awesomeness of media fasts for your body image here. You are well on your way to healthy, happy, awesome motherhood. Please know you are more than a body. Your body is awesome — it grew another body inside it for heaven’s sake (!!! ), and you are more than your body. Don’t ever let anyone sell you otherwise. Now go out there and “get your body back” by reclaiming it as your OWN instead of buying into the lie that you must obsess over the look of it instead of getting on to everything happier, healthier, and more important.